A decade later this remains one of the most terrifying things I have ever seen. As someone who goes to basketball games multiple times a week for work it is horrifying to think that a player would go into the stands and begin fighting a fan. I have been a big basketball fan since I was a little kid and I never imagined something like this would or could happen. Hell, I still don’t and I’m writing this in memory of it happening. I’m not sure that this is something that should command “let’s all learn a lesson from this” takes. 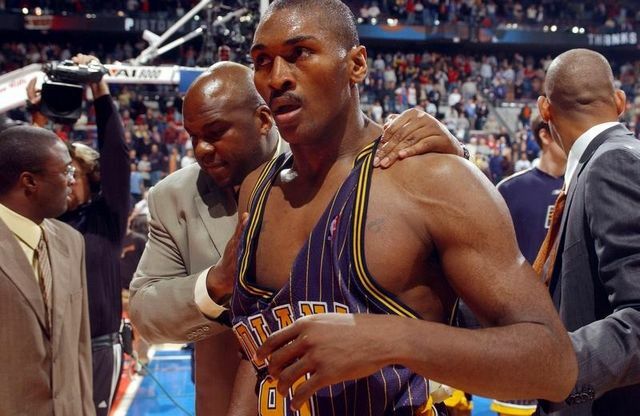 I’m confident this is not a laughing matter – Ron Artest against a normal human being in a fight is insanity. Frankly the only way to remember this properly is to remember it happened. Simple as that. Just remember that this was the night that the NBA broke reality. It all felt like some sort of nightmare. It was. We just happened to be awake for it.